Organised by Professor Abigail Green, Professor David Rechter and Dr. Oliver Cox, University of Oxford, and Dr. Juliet Carey, Waddesdon Manor. This workshop aims to establish the Jewish country house both as a focus for scholarly research and as a site of European memory. By focusing on a hitherto unidentified group of country houses – those that were owned, renewed and sometimes built by Jews – we aim to establish the importance of Jewish country houses like Port Lympne Mansion, Schloss Freienwalde, Villa Kerylos and Castello Sonnino as variations of a pan-European phenomenon deserving serious consideration from an academic and a heritage viewpoint. The workshop aims to bring scholars working on Jewish country houses, castelli, chateaux, Schlösser and Villas together with curators, museum and heritage professionals working either in ‘Jewish country houses’ themselves or in the area of European Jewish heritage more broadly. 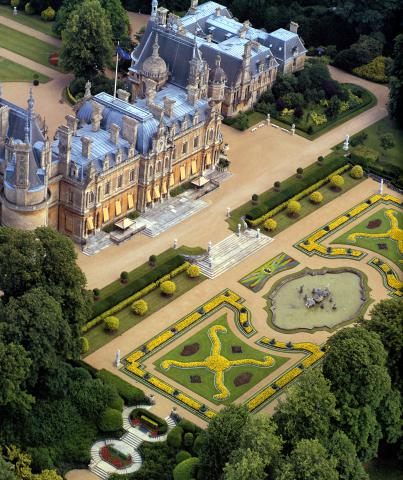 The two day workshop will be held at TORCH, University of Oxford, with a visit to Waddesdon Manor, the only surviving Rothschild house with its collections and interiors intact. Jewish country houses have so far escaped systematic study because they do not fit existing paradigms either in modern Jewish history or country house studies. The historiography of European Jewish elites has tended to focus on the grande bourgeoisie in its urban setting and does not consider the role families like the Bischoffsheims, the Bleichröders, the Péreires and the Sonninos assumed through their rural estates, nor the role of Jewish country houses in the self-fashioning of many leading Jewish figures such as Benjamin Disraeli, Ferdinand de Rothschild and Philip Sassoon in the UK, Leopoldo Franchetti in Italy, Walter Rathenau in Germany, and Théodor Reinach in France. Conversely, the literature on country houses, which typically focuses on the landed aristocracy, has paid little or no attention to the existence of country houses and rural estates in Jewish hands, or to the particular challenges this posed in a rural landscape and social context so powerfully shaped by Christianity.